I hate when a Director puts their name in a title and then we have to decide if that is part of the title or not. It’s less annoying when a group does it, say National Lampoon or Monty Python, only because there seems to be an identifying marker that comes with naming the group (not that National Lampoon means anything anymore). But seeing Wes Craven’s name in the title for NEW NIGHTMARE always irritated me. After seeing the movie, though, it makes sense. For once it works to have the title include the Director because the plot of this movie actually involves Wes Craven having nightmares about Freddy Krueger and writing a script about it. So, people of Earth, go ahead and feel free to officially refer to this one as WES CRAVEN’S NEW NIGHTMARE. You have my blessing. I watched WES CRAVEN’S NEW NIGHTMARE (1994) on 10.24.14. It was my first viewing of the film. Last Wes Craven had dealt with the Freddy Krueger series, there was no iconic Freddy. Craven left him, at the end of the first film, having been defeated in a non-ending which allowed him continue his rampage. Craven set the thing up to be a series, he just couldn’t have known how far astray that series would go. 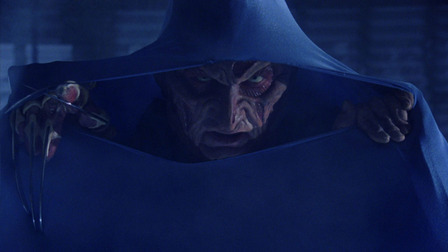 The third film may have been the best at realizing some of the Krueger potential, but none of the other sequels did the character much justice. Freddy is a harder character to get right than, say, Jason or Michael Myers. Those guys were created as freak monsters hiding behind masks, even if the sequels of those series bastardized them into something different. Freddy Krueger (Robert Englund, of course) is a monster from the nightmares of teenagers. When we are introduced to him in the first film he is stretching his arms to be over a dozen feet long in a weird way which makes it hard to really even define what his physical limitations are. The way he was defeated in previous movies seems to indicate that he is a fairly easy guy to rid yourself of (even if it is not a permanent kill), yet the things we see him do throughout just the first movie seem to show someone with limitless powers in a nightmare. When Wes Craven decided to make a seventh film, he knew he couldn’t merely try and tell another Freddy story. What he did was so amazingly before its time that it is impressive to watch twenty years later. Even if the movie isn’t spectacular, it is interesting. First of all, NEW NIGHTMARE starts with a production quality higher than any film previously made in the series. And that is a relief. Interiors look fully built, sets feel real, and the nightmarish stuff is well lit and effective. Heather Langenkamp is back, playing herself, and she somehow isn’t very good at doing that. She plays herself as an actress who wants to do more than Freddy movies, but is having emotional issues due to a stalker (which was a device stolen from her real life). In fact, everyone plays themselves here. Robert Englund is a mild mannered painter. Wes Craven is a Director stalked by a nightmare which he feels is the seventh Freddy film, so he writes it down. The film literally shows us the script at a few various points to show us that this is a script written by Wes Craven that is being played out in the ‘real world’ before our eyes. Freddy gets a makeover for this film. His knives are bio-extensions of his hand, not a glove. His makeup is more cartoony, but also more grotesque. He is supposed to be the ‘true’ Freddy, not just some character. To extend the facade, the end credits list Freddy Krueger as playing ‘himself’. Really, this movie is meta before that phrase really meant anything. A full two years before Craven would turn his focus to the genre-enhancing SCREAM series, NEW NIGHTMARE is about the making of a movie, about the actors, and about the genre as much as it is about Heather trying to save her son from being taken over by the spirit of Freddy. The scares are better than at any point in the series, save maybe the third film, and the entire movie has a much more legitimate feel to it than at any other point in the series since the first one. For all of that, this isn’t a wonderful movie. The final battle is, sadly, anti-climatic. They play off Hansel and Gretel a bit too much, and we see Freddy as a limited villain who isn’t able to stretch his arms one last inch to catch a kid, even though the movie has already established him as fairly all powerful. The acting takes a small step forward, but no giant leap. Truly, the only solid performance here is from the kid (Miko Hughes) who plays schizophrenia with surprising power. But, importantly, this movie puts a smart and capable button on the end of a flailing series. This is a movie which has a potentially high rewatchability factor. That’s a rare find in the NIGHTMARE ON ELM STREET box set. I give the film a bonus point for being innovative and delivering a horror movie that had never quite been done that way before. ~ by johnlink00 on October 25, 2014. Another stellar review! I always liked this one and thought it was creepy as a kid. But you are 100% correct about the ending… terribly underwhelming. I am interested to see if you do Freddy vs. Jason and the Nightmare remake. I did the Nightmare remake a couple years ago… I was underwhelmed. But I would be interested to see it again having more knowledge of the entire series. Freddy Vs. Jason I have to track down. I do want to watch it now (last saw it in the theater). Wish it was in the box set, haha. No kidding! It did make it into the Friday the 13th Blu-Ray set from last year. I liked Freddy vs. Jason. I am just amazed they finally got it made. At one point there were.. 4? scripts floating around for it. I read one that was never produced. Really odd stuff. Nice review – kind of wished you liked it better, because this is one of my favorites in the series, but it seems like it didn’t annoy quite as much as the last two.